The best way to quickly understand Dubai is to take a 40-minute Seawings seaplane ride. It may not be the cheapest way to see the city but is a real eye-opener, excessive yes, but a wonderful introduction to a fascinating metropolis. 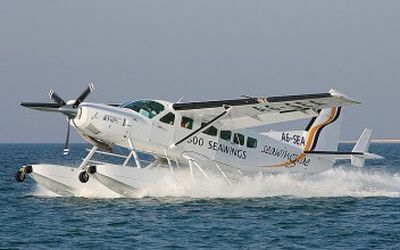 Seawings was established in 2007 and operates three single pilot nine-seat Cessna 208 Caravan seaplanes. You take off and land on water. The seating is 1+1 with glorious views for everyone and the co-pilot’s seat up for grabs. No joystick for that passenger. It has been taken away. Cruise speed is 130 knots, about the same as the Shorts Empire flying boats that frequented these waters once upon a time on the way to India and Australia. Your pilot might be an experienced Australian bush flyer, or a Canadian getting away from the cold on a six-month contract. Many have flown in the Maldives ferrying clients to island hotels, but there is nothing to do in the evenings. These days Dubai is 24 hours. Three 40-minute flight routes are available. From the Dubai Creek Golf and Yacht Club out and back; starting and finishing at the Jebel Ali Beach Hotel; and finally by taking a 25-minute boat ride from the Waldorf Astoria on The Palm to the World Islands and then landing at the Yacht Club. This one you can do in reverse. For Business Travel News the flight was from World Islands, an artificial archipelago of various small atolls constructed in the rough shape of a world map about two miles from the coast. There was ample evidence of work progressing, but Seawings passengers used a floating jetty. No dry land starting point yet. “Lebanon” is established and now a beach club and on one island there are show houses and a heliport. Sceptics thought that The Palm would not happen, but it has. The World will follow, perhaps not so quickly. Getting airborne we homed in towards the Burj Al Arab, 202 rooms only 28 floors, every suite a duplex, a concierge on each floor, and naturally a helipad, sited 210m above sea level. The shape of the structure is designed to mimic the sail of a ship. Don’t think you can just take a taxi to the place and walk in. Every afternoon a British seven-course tea is served, reminiscent of the Savoy, but you do need to make a booking or you will never get past the security. The same goes for an aperitif in the Skyview bar at the very top. Here there is a selection of restaurants. We flew on climbing to 3,000ft and above the amazing Palm Jumeirah. We viewed from the sky another dining venue, and a surprising one, The Bushman’s Bar and Restaurant in the Anantara complex. This is a top quality Australian-themed restaurant at the very end of the man-made complex, part of a resort development of just under 300 villas and suites plus a large ballroom, meeting rooms and a variety of eating places. Allow time when driving from the mainland. 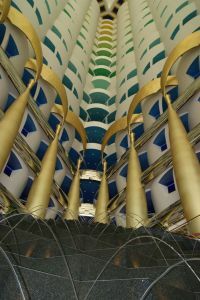 It is a 10km ride out into the Persian Gulf, past huge luxury apartment blocks, the iconic Atlantis Hotel and the already mentioned Waldorf Astoria. Bushman’s has imported everything including the kitchen and serving staff and has some typical offerings including seared Queensland scallops, duck and mango salad with native tamarind dressing, kangaroo sirloin with sweet potato fritter, quandong chilli glaze and pak choi and Australian pavlova. Aussie beers as well. Next up, and a safe distance away, was the Burj Khalifa, currently the tallest man-made structure in the world, topping out at 829.8m. An outdoor observation deck, named At the Top, opened on 5 January 2010 on the 124th floor. The ride up takes about 25 seconds at 40mph. There is a café (and inevitably a shop) at this level. Take another lift to the Sky level at 148 and 555m. From here you get an astonishing view way out into desert. Your vantage point is one third of a mile up. Our haven in Dubai was the Four Seasons Resort Dubai at Jumeirah Beach (See BTN 13 April), the entry point to another man-made offshore assembly, Daria Island, clearly a venue for the super-rich and in the construction stage. From the air it is simply astonishing, and outlandish. It is well on its way. What will happen when it is completed? Where will the next development be? From the seaplane the mind races. We pass by the Meydan Racecourse and the Ras al Kor wildlife sanctuary. To the right is the international airport. All too quickly our 40-minute flight is over and we line up for landing in the Dubai Creek, beautifully smooth. A handover at the landing platform to a golf buggy and onwards for the clubhouse.